This is a classic style women leather jumpsuit which is made with lambskin leather. It has a round neckline and elastic waistline. 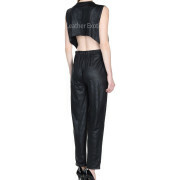 This is a sleeveless women leather jumpsuit for women which has back cutout and side zipper closure. This is an ankle length round neckline women leather jumpsuit which is available in many colors and all sizes. Also, it is fully lined and best corporate style women leather jumpsuit for women.